On November 20th, Google has officialy launched a new feature in their search results pages, called SearchWiki. Already, the new feature has generated quite a lot of buzz including positive and negative feedback. SearchWiki is a Web 2.0 inspired functionality that allows signed-in Google users to customize and interact with the listings of the search result pages. Signed-in Google users can improve, remove, add and comment on listings in their Google search results page ( See the Search Engine Land 101 Guide to SearchWiki). The changes in the rankings only apply to the user account, when he performs the same search and therefore have no known impact on the search engine results pages in the Google index. However the comments can be seen by any signed-in users who perform the same search and click on the "See all notes for this Searchwiki" at the bottom of the Google SERPs. Even if the user modifications have no influence on the official Google listing, Google has not excluded the possibility of using the data collected ( all the comments, vote and addition are saved in your Google account) to improve the relevancy of their search engine rankings. Such change could have a tremendous impact on SEO as Google will become an human-algorithm-powered search engine, a sort of mix between the current Google search engine and Digg. Other search engines such as Irazoo have explored this concept in the past, but if Google follow this trend, the way we do SEO will change dramatically! Relying on the traditional on-page optimization and link building might still get your website on the first page of the Google listing, but if the content, the design or anything else does not please the users, your website might drop into the lower pages.. The rules will definitely change; More importance will be given to the content quality, website usability and customer service effectiveness rather than the number of link and on-page factors. OK it is a futuristic scenario! In the near future, SearchWiki is not likely to have a huge impact on search engine rankings. As mentioned by Danny Sullivan, one of the potential benefit is to have your website listed in the "See all notes for this SearchWiki" for your main keyword as well as generating comments that could influence internet users to visit your website... Except this, SearchWiki is at this stage a way to make Google more Web 2.0 and social media-ish! On the 3rd November, Google Australia and Sensis have come to an agreement to offers users of Google Maps the ability to search the local business listings provided by Yellow Pages (part of Sensis). The alliance is quite a smart move for both players. The Yellow Pages content is arguably one of the best and most exhaustive local business content in Australia, which should give Google Maps another competitive advantage. For Yellow Pages (Sensis), the agreement comes at the right time to give a kick to Yellow Pages. 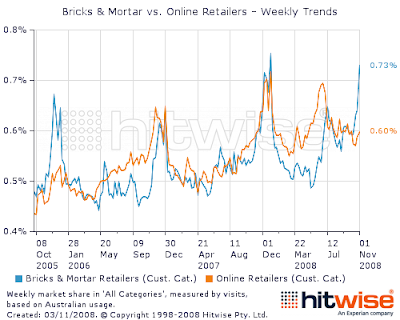 According to the IAB/PriceWaterhouseCooper report for the third quarter of 2008, the share of online budget spent on classified has only grown by 2% compared to the same period in 2007, and the biggest players in the market: Seek and RealEstate.com.au have not shown many signs of growth either. The agreement will potentially increase the reach of Yellow listings and should therefore increase their value. The deal also includes search! Starting in January 2009, Sensis will serve Google Adsense Ads in combination with the ads served from the BidSmart program (Sensis owned PPC Advertising Network). As mentioned in Search Engine Room, the newly developed alliance also put Yahoo and True Local (News.com.au) on the side as Google was previously using True Local listings on Google Maps and Sensis was using Yahoo Search Marketing to provide search advertising ads. It is definitely a bad year for Yahoo! Advertisers are more and more interested in spending their advertising budget in high ROI channels with a maximum transparency. The pay per performance model (CPC,CPL, CPS) introduced by online advertising networks seems to have spread out well over the online channel. I recently came across a TV commercial on free to air promoting Pay Per Lead TV Ads! - It is hard to accurately measure the impact of TV commercials on sales and leads. - TV is also an expensive media channel so more transparency on the ROI is always welcome! - They report on the results. - The advertiser pay for all the leads. Ben Shepherd mentioned that it could be really hard to measure the results from TV as TV exposure has impact on other channels (Someone sees a TV ads and then uses search to find out more, and then convert). From what I have seen with the Pay Per Lead TV campaigns they have done, the TV ads implies a call to action through the phone and/or internet, which can be tracked easily and accurately. For example, the advertiser can redirect the audience to a specific landing page of their website or/and set up a specific phone number for the ad and measure the number of calls. Ben Shepherd is right though. It is highly likely that people exposed to the TV ad will use other channels to reach the advertiser. Search is a great example. In Drive to the web activities, I have noticed up to 5% of the audience using a search engine rather than the URL display in the Ad. These 5% represent additional leads that won't be tracked (lucky for the advertiser, which won't have to pay for it). However, the situation can also be tricky if a prospect uses a search engine to reach the advertiser, but cannot find it! An Offline/Online intergrated approach will make sure that the offer is accessible in multiple channels. A Google Adwords or Yahoo Search Marketing campaign targeting a handful of keywords will be a cost effective approach, that will allow to capture all potential leads generated by TV and therefore keep a maximum transparency on the TV Ads ROI. 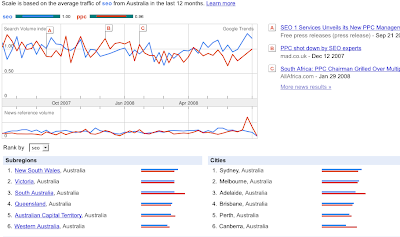 Due to time constraint, a reader from SEO Sydney Blog is selling his website called www.seovoter.com. It is a great opportunity for someone, who want to take over an interesting web 2.0 project related to SEO. Basically SEO Voter is the 'Digg' for the SEO industry. SEO Voter is a free search engine optimization network repository, where you can vote for and promote good SEO content, news, search engine marketing articles and directories. The website uses Pligg, a Web 2.0 open source content management, based on PHP/MySQL. The owner would like to get around US$ 600.00, so if you are interested, feel free to send us an email at seosydneyblog(at)gmail.com and we will follow up with the owner. The Australian Direct Marketing Association (ADMA) will organise a search engine marketing half-day seminar on the Thursday 21th August. The seminar will focus on search engine marketing including tracking, reporting, optimisation technique, and a large amount of useful tips to improve your knowledge of search marketing. From the leaflet, this seminar is more targeted at brand & marketing managers and should not be too technical. - Jon Ostler, Managing Director of First Rate. Looking for a discount on paid links, Text Links Ads is offering 15% Off your order for the entire life of the order until the end of May. To take advantage of this offer, you need to visit the TLA website and enter the coupon code: may at check out. Australians are really active and prolific to come up with online initiatives that aims at tackling the issues of climate change. While a great news for Australia and the planet, it seems that these enterprises have unfortunately not reached their high of success. In early 2007, Blackle, a version of the Google custom search engine was supposed to save energy by displaying a black background instead of a white one. While valid a couple of years ago when CRT monitors were the most popular, the theory behind Blackle has been actively disputed due the rapid emergence of LCD screens. The benefits of a black background are in fact really low or inexistent and therefore the whole Blackle idea is more a cash-machine than an eco-friendly solution. The latest Australian 'green' initiative came this year with EcoCho, a free green search engine. EcoCho claims that a thousand searches on Ecocho allow Yield Media (the company behind EcoCho and part of the Photon Group) to buy enough carbon offset credits to remove 1 ton of CO2 from the atmosphere. This works out at two trees spending a year sucking CO2 from the atmosphere as they grow. The concept behind EcoCho has been easily criticised, but I personally find it great as it uses the revenues generated by sponsored links from Google and Yahoo to make a direct contribution to the environment. Yield Media makes a profit, but share it with a good cause! Is not it what sustainable development is all about? In that case, the concept is not really the question. The issue came from Google, which argued that EcoCho does not satisify the Google Adsense's publisher policy (the advertsing program used by EcoCho to generate revenue). In this case the site was in clear violation of our terms of service and we had previously warned the owner of past violations. We have now stopped serving ads and search results to the owner's sites. To ensure maximum click relevancy and avoid fraudulents clicks, the Google Adsense guidelines require a publisher not to push users to click on the sponsored links or to compensate users for clicking on the Google Ads. This rule is one of the reasons why Goolge refused to provide its search facility and ads to EcoCho. While it seems to be clear to Google, it is different for Tim MacDonald, one of the founder of EcoCho. According to him, Google is not really consistent in applying these rules. Other websites are using Google's technology for similar causes, but have not been refused the access to Google technology. What makes MacDonald even more bitter, is that they presented the website to Google beforehand and they did not mention the violation. According to the Sydney Morning Herald, it is not the first time that MacDonald or its company, Found Agency, had issues with the application of Google's guidelines. In this situation, it is more ambiguous (As ambiguous Google's Guidelines?). The good thing though is that EcoCho can still use the Yahoo search technology and its ads platform to generate revenue. The bad is that Google has around 80% of share market in the search market, so the potential of generating revenues and therefore planting trees is not so great.